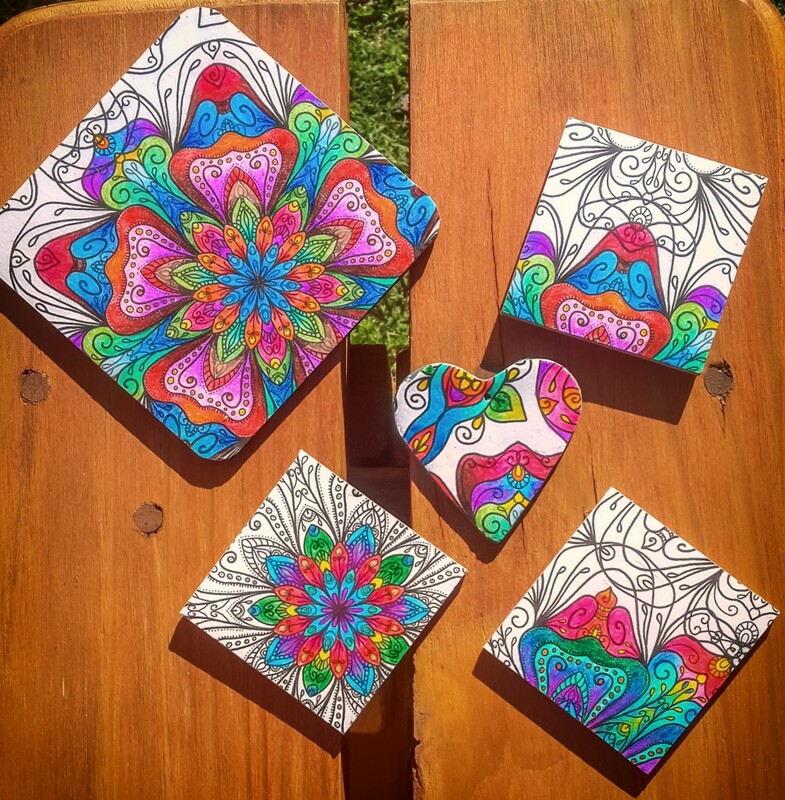 Tutorial – Crafts from Colouring Pages! I had a brainwave today, while thinking of surfaces I could draw/paint on. 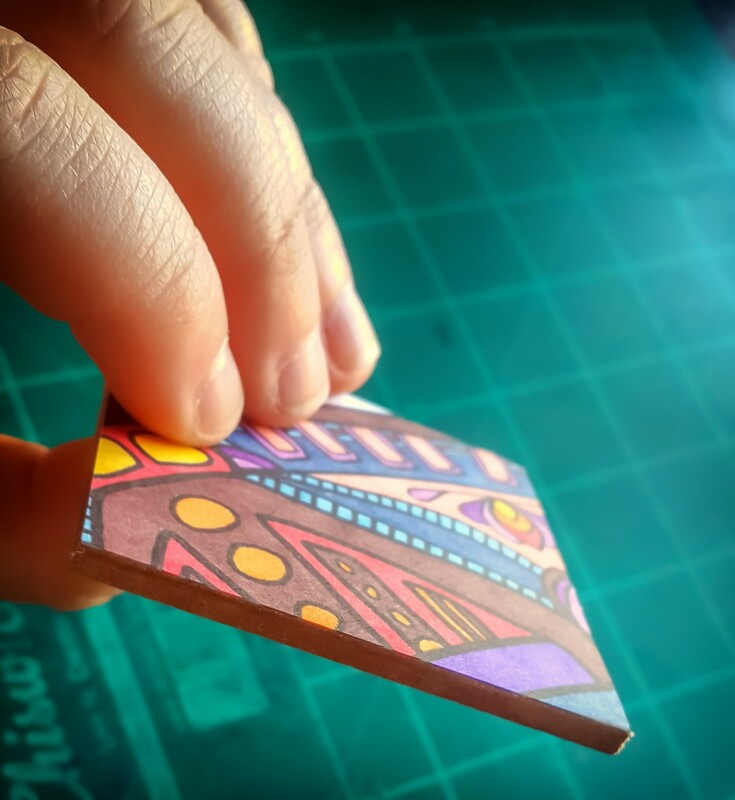 I bought some ‘blank’ coasters and magnet squares (just squares of smooth plywood) a long while back that I had intended to cover with clay, but never got around to using them – and initially thought I could paint them white and then doodle over that, but then thought – hey, could I just stick my pre-coloured pages to them maybe? A page you’ve coloured (with non-soluble media; colouring pencils work great, sharpies work great, but gel pens will smudge when you apply the glaze – test first if you’re not sure), a surface to apply to (here I’m using a small square of plywood), pencil, paintbrush, glaze (I’m using ceramic glaze), glue (I’m using normal craft glue), a scissors (craft knife comes in handy too) and a toothpick. The page I use here is one of my own designs that I’ve printed on normal printing paper with normal printer ink, nothing special, and then coloured with sharpies. Place the object you’re covering onto your colouring sheet and trace around it. Cut out the shape, and then spread your glue onto your surface with the toothpick (which works much better than a brush for this – glue is thick!). Make sure you get right up to the edges with the glue. I’m using a glue that dries clear so it doesn’t matter much if I go over the edges. 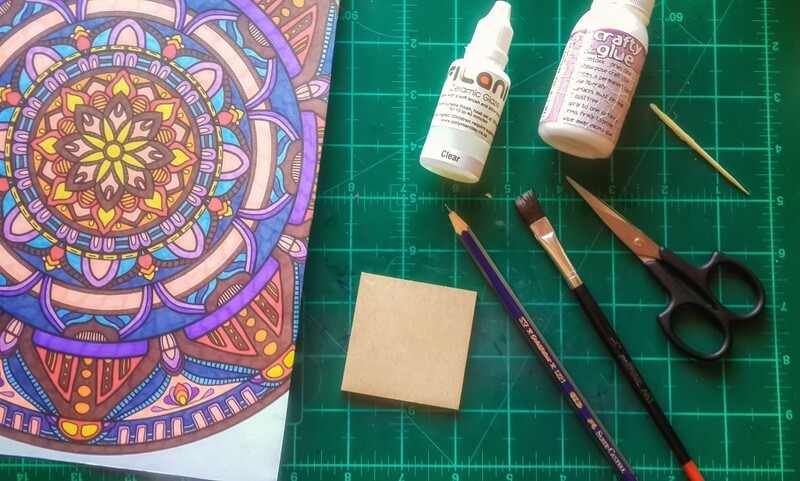 Carefully place your colouring page onto your surface and smooth it down. 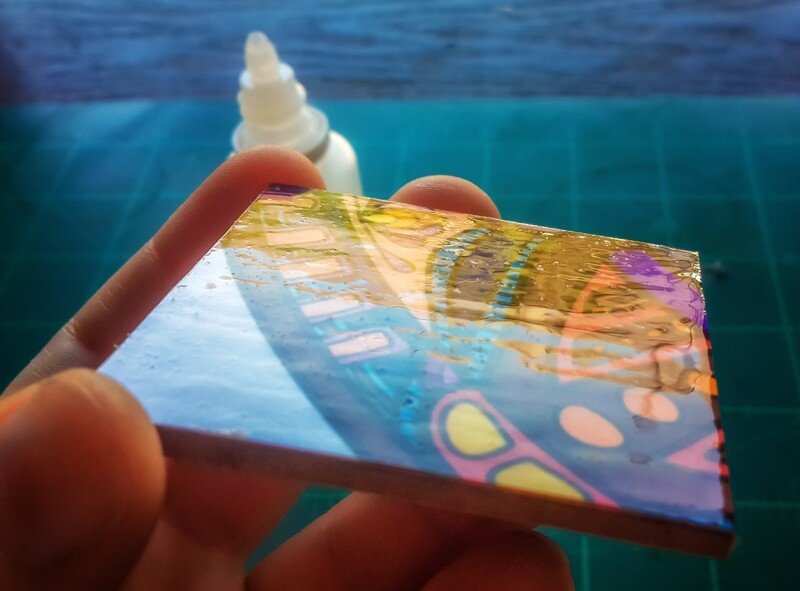 Make sure it’s aligned properly, wait a few seconds for the glue to start to take, and then flip it over and trim the excess off from around the edges if there is any. A craft knife works well for this but you can also just use a small scissors. Wait half a minute or so for the glue to bind the paper in place, and then apply your glaze. Using a damp brush helps the glaze spread more easily. Don’t worry about small bubbles or brush strokes in your glaze – you’ll let it sit and any ‘bumps’ will smooth out. Do check for hairs though! Wait the required amount of time for your glaze to dry, and then continue applying coats (read the instructions on the glaze) until you get a finish you like. 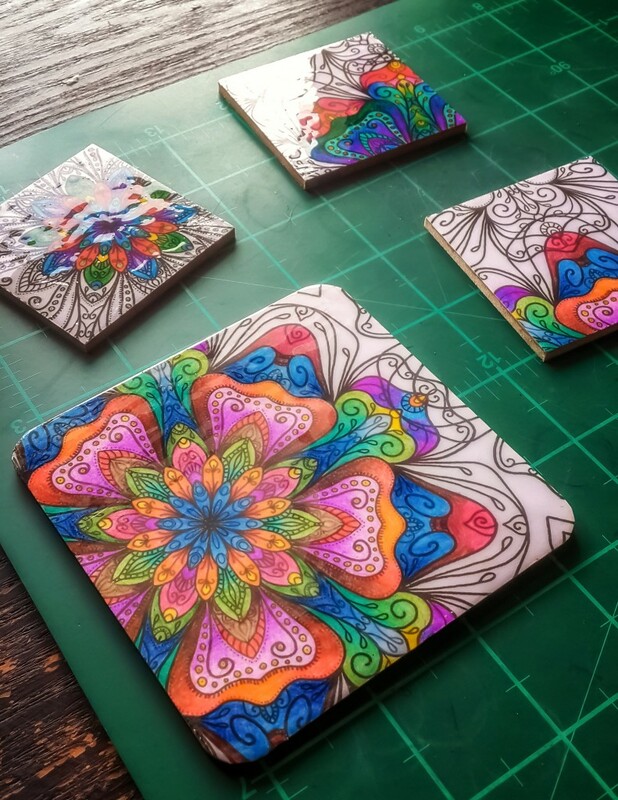 Here I’ve got one coaster and three small magnet squares glazed and drying. The glaze I use gets glassier the more coats you apply, so I apply a coat and let it dry for around ten minutes and then apply another. Check the instructions on your glaze for techniques you can use. When you’re done, you’ll have some durable and very very pretty items that have put your colouring pages to good use!